Yes, there's a lot to digest in this hodgepodge concert: there are so many well-known pianists, string players and other instrumentalists involved in performances of the various works that this Verbier Festival concert could be called a gathering of many of the world's classical music superstars. Indeed, and the superstars were not just among the performers: Alfred Brendel served as Emanuel Ax's page-turner! Anyway, as the reader can glean from the heading, the performances here are mostly of partial works. In the case of the Chopin Preludes, they appear complete, but half are adapted for piano and another instrument, although #15 is an adaptation for strings alone. The concert begins with a splendid performance of the second movement of the Schubert Op. 99 Piano Trio by Evgeny Kissin and the Capuçon brothers. But, oh, you wish the whole work were included. The same could be said of the Dvořák and Schumann Piano Quintets, as those renditions are also very convincing here. What a remarkable artist Menahem Pressler is: he was a few months from turning ninety years old when he gave this splendid performance in the Dvořák. The Göran Fröst Klezmer Dance #3 is a catchy short piece and it gets a very spirited performance from Fröst and the Verbier Festival Chamber Orchestra. Monty Alexander's Happy Birthday Variations is mainly a jazzy take on the popular birthday song, well played here by the composer. The two pieces from Prokofiev's Cinderella, as adapted by Pletnev for two pianos, are also excellently played. Galop is thoroughly exciting, about the most breathlessly paced performance in the concert. The Chopin Preludes offer a broad spectrum of performers and interpretations, yielding quite a unique treatment of the work. Purists will probably not take well to most of Dmitri Sitkovetsky's adaptations, but open-minded listeners will find them imaginative, even if they don't always succeed. I don't find #2, for piano and viola, a convincing adaptation (ditto for #9), but the ensuing G Major works better for violin and piano. Surprisingly, the clarinet part in #3 is among the most effective adaptations – and Fröst and Quentin turn in fine performances too. Pletnev is perhaps a bit laid back in #7, but quite sensitive still. One of the Preludes, #10, is given a jazzy improvisation by Monty Alexander. It doesn't work for me at all, though lovers of both jazz and Chopin (not a large group, I'm sure) might like it. Trifonov is a little muddy in #11 but exciting nonetheless. #15, for string quartet and double bass, is very atmospheric and haunting. Khatia Buniatishvili gives a very virtuosic performance of #16, but is just a little too hurried. However, her performance of #19, with violinist Renaud Capuçon, is very good. Maybe the best Chopin performances of the night are by Emanuel Ax and Evgeny Kissin: in #20 Ax makes the music sound so ominous and stately and in #24 Kissin imparts a powerful sense of agitation and desperation. The sound reproduction and camera work are both quite fine. 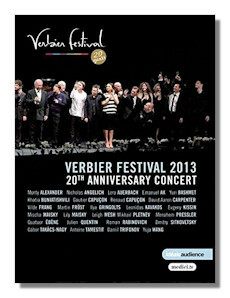 So the verdict here is that if you like multi-performer concerts offering mixed fare, this Verbier anniversary DVD should offer considerable appeal.